Before moving into brand new Shea Stadium in 1964, the Mets played their first two seasons in the Polo Grounds, the former home of the New York Giants. 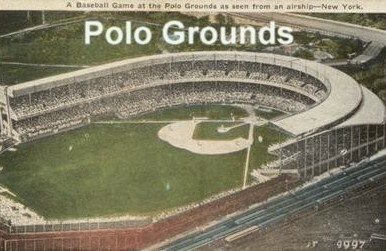 The Polo Grounds were located in Upper Manhattan and one of the reasons the Giants wanted to move is that the neighborhood was not exactly five-star quality. Additionally, the Giants put little money into stadium upkeep the last decade they played in the Polo Grounds. The baseball Giants last played in the Polo Grounds in 1957 and the stadium stood vacant until the Mets began play in 1962. So, we have an old, decrepit stadium. And to make matters worse, the dimensions were hardly favorable for a baseball field. The layout was compared to a bathroom tub, with short distances down the foul lines and a huge center field, rumored to be near 500 feet. The exact dimensions are not known, they were not listed on the walls as is common today. But most estimates have it around 280 feet to left field, 257 to right field and 505 feet to center. But the actual distances were also uncertain due to second deck overhangs. In left field, the overhang made it about 250 feet. There was even a center field overhang but it’s unlikely that affected too many home runs. But those funky dimensions certainly produced odd home run totals. The Mets hit 93 HR at home in 1962 and only 46 on the road. The following year those respective numbers were 61 and 35. Most people know that Frank Thomas holds the record for most home runs hit for the Mets in the Polo Grounds. Thomas hit 26 HR in his home park in 1962 and 1963 combined. But hardly anyone knows who hit the most home runs against the Mets in the Polo Grounds. Actually, two players tied for the most, which was 7 HR. Few will be surprised that Hank Aaron was one of the players. Aaron hit 5 HR in 1962, when he had a .500/.550/1.059 line against the Mets in 40 PA. A year later, the Mets figured out a way to pitch the future Hall of Famer, holding him to a .333/.395/.538 line with 2 HR in 43 PA. I could give you 25 guesses and I don’t think you would get it. So, to put you out of your misery, I’ll simply tell you that it was Don Demeter. DeMeter made his major league debut in 1956, when he played in three games for the Brooklyn Dodgers. His career lasted until 1967 and in parts of 11 seasons in the majors he played with five teams and hit 163 HR. He hit 20 or more HR in four consecutive seasons from 1961-1964. He finished eighth in the National League with 29 HR in 1962. Like Aaron, DeMeter hit most of his Polo Grounds homers against the Mets in 1962. He had a 6 HR and a .450/.500/.1.025 line in 46 PA in the Polo Grounds in 1962. A year later he managed just a .417 OPS and 1 HR in 30 PA there. DeMeter would punish the Mets in another fashion. Following the 1963 season, the Phillies traded him along with future Met Jack Hamilton to the Detroit Tigers for Jim Bunning. Of course, Bunning went on to win 18 games against the Mets. He was 12-2 against them his first three seasons in the National League, including a perfect game in 1964. ← Where does Duda fit in Mets’ 2011 plans? I remember going to the Polo Grounds to see the Mets play, either in 1962 or 1963, and that a pitcher hit two home runs in a game against them, and I’d like to know who. I don’t know if they were grand slams or not, so perhaps you might also know what opposing pitchers hit grand slams against the Mets in the Polo grounds. Hope you can help. This question has been bugging me for years!